1. Added support for the Device Recording Mode. 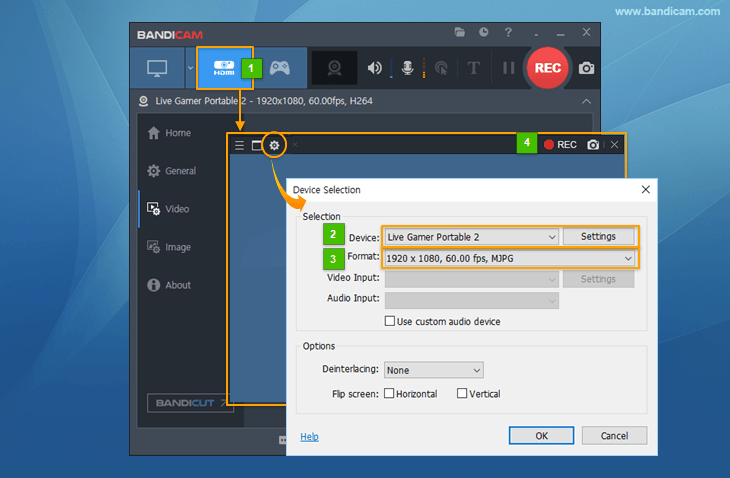 - Bandicam is now able to record an external capture device such as a Webcam, XBOX/PlayStation, Smartphone, IPTV, Capture card, etc. 2. Webcam preview is displayed if the 'Add webcam overlay to video' option is checked. 3. Applied new Bandicam UI design for Webcam/HDMI recording. - The H.264 (NVIDIA NVENC) encoder didn't work on games which use PhysX. - Sequence number file naming of image capture didn't work properly.